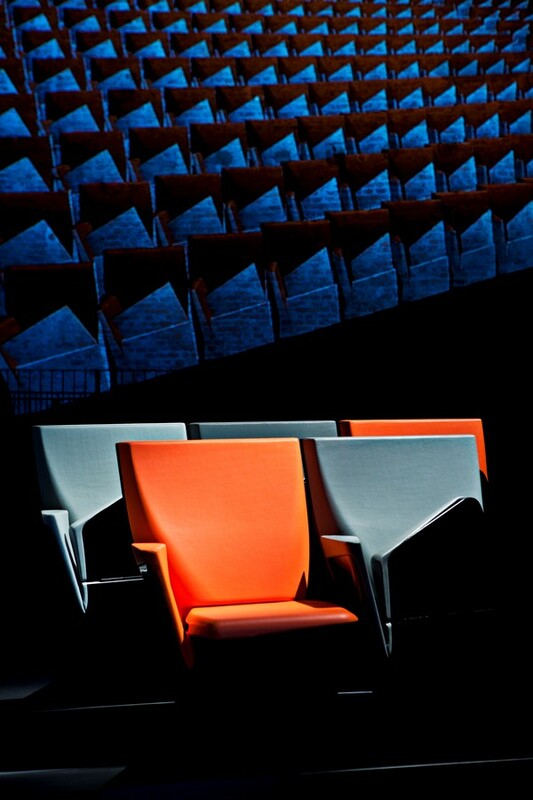 Array auditorium seating is an innovative new collaboration by Zaha Hadid Design for Poltrona Frau Contract. So many architects are now designing furniture, as they try to extend their areas of remit and as the economy struggles. In the past we of course have many examples – Le Corbusier, Mies van der Rohe and Marcel Breuer all designed what came to be very popular high-end designs. The danish architect Arne Jacobsen not only designed furniture but a whole room at the SAS Hotel in Copenhagen. Towards the end of the 20th century we had Norman foster designing the Nomos drawing table and door handles. Eva Jiricna has designed scarves, Jan Kaplicy has designed a circular sofa (which we feature on this site) and many others have designed products from cutlery to clocks. But Zaha Hadid surely stands above all of them i the sheer range of products she has turned her hand to. We feature on e-architect her designs for shoes, bowls, chandeliers and even a boat! Adrian Welch – e-architect Editor. As a stand-alone piece, Array’s design is driven by the seamless transition from a sculpted block of Euclidean geometry into a dynamic, twisting gesture. This accentuated rotation merges the backrest, armrest and seat into a compact bud from which these three elements blossom. The striking angle of the seat challenges auditorium seating typecasts while the uncompromised ergonomic design gives exceptional comfort. As a field of multiplicities, the twist in each seat breaks the otherwise continuous bands imposed by rows of traditional auditorium seating to reveal the theatre’s space as a completely immersive environment; a differentiated array that generates a unique perception of the auditorium from every position within. Poltrona Frau Contract’s engineers and craftsmen have masterfully interpreted the essence of Hadid’s pioneering design.